Enrich your terrorist life with music! A British-based company is selling MP3 players which can be attached to an assault rifle. The "AK-MP3" player is built into the ammunition clip of a Kalashnikov. 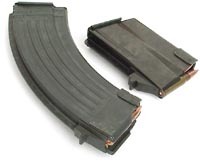 It can be swapped with the real magazine carrying bullets and inserted into the weapon. The device is being advertised on the internet by a Buckinghamshire-based company set up by a group of Russian businessmen. It comes with enough storage space to hold 9,000 songs. Former Russian rock star Andrey Koltakov, a partner in the dotcom company offering the AK-MP3 for sale, said: "This is our bit for world peace - hopefully, from now on many militants and terrorists will use their AK-47s to listen to music and audio books." The accessory costs just over £200 or around £400. According to those marketing it the stainless steel body makes it "uniquely suitable for outdoors". AK-47s are the choice of killers across the globe from Marxist guerillas in Colombia to Saddam Hussein loyalists in Iraq. They were also used by IRA snipers. They are capable of firing 600 rounds a minute. Θα εμφανίζεται ως εξής: Enrich your terrorist life with music!